I like to Show some of my Squats here in the hall of honour, but one rule of this Forum is: No Xenos! But Squats are no xenos, they are transhumans, like the Astartes, not by genotech, but by Evolution. Similar Problem: Are IG Players allowed to Show their Ogryns and Half...err ...Ratlings? Sadly, if they are not covered by an Imperial codex, no dice. There was a thread like this one where Brother T (iirc) made it perfectly clear, but having said that, that clarification was prior to the sites includion of IG. The abhumans that are included as units/rules in Codex: Imperial Guard are allowed. The Squats are another issue that we'll have to discuss among the mods/admins. While the Squats were abhumans (not transhumans) and would seem to fall under the same provisions as Ratlings and Ogryn, they were effectively removed from the game universe by the Tyranids. The last indicators we had were that the dwarves in space concept that the Squats represented was being resurrected as the Demiurg in Battlefleet Gothic, but nothing really ever came of that. Whether the Demiurg were xenos or abhumans was never really revealed. Both the Squats and the Demiurg have been mentioned in recent lore, but not as units/rules. Well assuming that he plays Squats as IG under current rules, can he not present them as count as? Edited by Azatoth, 30 October 2013 - 09:51 AM. Just leave me some ammo, a little water.........and some chips if you got 'em. I know someone who did some Squat conversions with WFB Dwarf bodies, IG arms, GS'd their chainmail into greatcoats and replaced helms with miner style hats. Used IG tanks, C:IG unit/weapon options, etc. Looked very cool and on the basis that it's a count-as Imperium codex, I'd be happy to see stuff like that. Edited by Strike Captain Lysimachus, 30 October 2013 - 12:29 PM. People tried to do this in the past with exo armour squats saying they were just their space marine army. Conversion armies are fun but at what point do we say nope can't go there. People have tried similar things with Tau on here too. We don't allow Gue'la units for example. We didn't allow exo armour squats back in the day either. So it gets to be a question of drawing that line. We don't want to stifle creativity but we also have a very particular focus that we need to maintain. I don't know if the Tyranid thing was ever official, however, that seems to have been retconned by 6th Edition anyway, as Squats are mentioned in the rulebook as one of the abhuman races found in the Imperium. 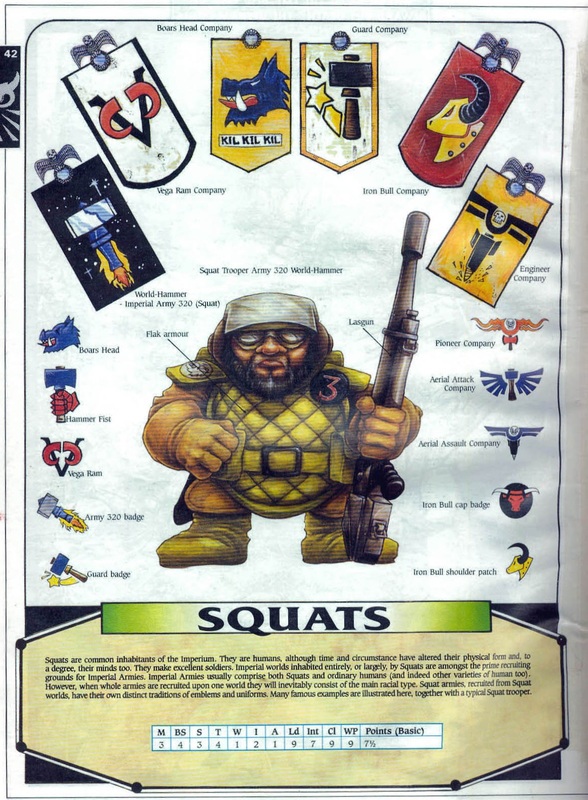 I can't imagine GW ever brings back the Squats given their current business model. Just pointing out that technically the unofficial story about them being eaten by Tyranids seems to have been removed, or at least the idea that Squats were extinct has been changed. Nothing to do with the forum rules though, obviously. According to the B&C moderator thade my "appeal to authority falls on deaf ears"
Well, the Squats are a official, not-extinct, race of abhuman Imperial citizens according too the newest rule book. Given their proud tradition of service in the Imperial Guard, close relationship with the Adeptus Mechanicus, multiple contributions to Imperial Technology, and their worship of the God Emperor and adherence too Imperial Law, I honestly don't see how they could be considered as anything but loyal and valuable members of the Imperium and this board. I have some ratling squat homo sapiens rotundus refugees serving as snipers in my IG army alongside beastmen homo sapiens variatus penitents. I hope I don't need to grant them the Emperor's Mercy. Oh the decision on squats was long before you were ever here Momo. This was from back in the days of EZBoard B&C. I don't suppose any sort of progress has been made concerning the Squats' place here on the B&C? Assuming these are Imperial Squats being discussed, not Xenos-hugging pretender races such as the Demiurg and their ilk. There has been discussion, but we're holding off on a final decision because there are a couple of other issues that we'd like to deliberate on. Ideally, we'll make decisions on all of the issues in a way that ensures everything is considered and the final outcome is an integrated one. And the Squats clock is reset yet again. Keep in mind, though, that they must be clearly WH40Kified. If a "Squat" army looks like they are hiding a book of grudges under something that barely resembles carapace armour, we may consider excising them. Also, whether or not the Demiurg are actually Squats, or if they are simply a xenos replacement for the Dwarves in Space concept that the Squats used to fill, is yet to be determined. So the Demiurg remain prohibited for now (this really only affects our Battlefleet Gothic fans). Please don't abuse this. We want everyone to be able to enjoy the hobby, but it takes time and effort for the mods to clean up the abuse. If we reach a point where too much mod/admin time and effort is wasted because people are abusing this, we'll kill the Squats again. Don't screw this up for everybody else.